The picturesque place of many choices; trekking, bird watching, outdoor camping and boating. Heading towards Gavi by Periyar Tiger Reserve is a thrilling experience as the ride goes past hills and valleys, tropical forests and abundant plantations giving you the closest look at wildlife especially playful elephant herds. The sleepy wind-stricken village of verdant landscape and cascading waterfalls. This village offers a bird’s eye view of the extensive coconut groves of Kamabam and the palins of Theni in neihbouring Tamil Nadu. This trekkers’ paradise is rich in flora and splashing streams. The place is also set apart with a typical natural beauty. An off-beat trekking spot. 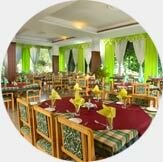 With the guidance of Tourist Amenity Centre here, you can explore nature and go adventurous. This mountain peak that overlooks eastern slpoes of the Western Ghats and the vast plains of Tamil Nadu. The place owes its name to the tale that the lord Sree Rama, the Hindu mythological god had set his foot on this rock. Also, Kerala’s biggest statue, Kuravan & Kurathy treats you here. The rocks, between which the Idukki Arch Dam was built, are named Kuravan & Kurathy, two histrical characters of the local comminity. 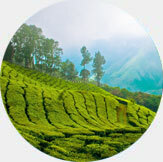 From the top of a cliff here, enjoy the panoramic view of forests and plantations seen as an endless carpet of greenery. The world’s second and Asia’s first arch dam built acorss hills. It is 650ft. in breadth and 550ft. in height. The underground powerhouse at Moolamattam is yet another attraction. Adjacent to the dam lies Idukki Wildlife Sanctuary. Both a pilgrim destination and trekiking track. The view of Idukki Arch Dam from here is sure to enthrall you. 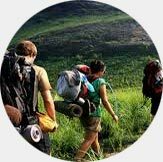 The State Forest Department conducts trekking expeditions exploring the wilds. The temple dedicated to Kannaki is situated on the top of a hill in Periyar Tiger Reserve. You have to cover 12kms of rough forest road to reach here. The temple opens only once in a year for the public during the annual chithrapournami festival. A trekker’s paradise and the highest peak in Thekkady. Literally means the ’mountain of the cross’, this hill offers a panoramic view of surroundings including a glimpse of Periyar Lake, Kumily town and vast areas of nehbouring Tamil Nadu state. Other choices for leisure include Boat cruise in Thekkady Lake, Bullock Cart Discoveries, Bamboo Rafting, Plantation and Tribal Visits etc.